Happy Valentine's Day! Whether today was a day spent with family, friends, significant others, or relaxing at home, I hope each and every one of you felt loved. Flowers and chocolate seem to be the staples of any valentine gift. What girl doesn't love the two? I'm personally a huge fan of flowers. But my favorite flowers are ones that dry well or keep growing. 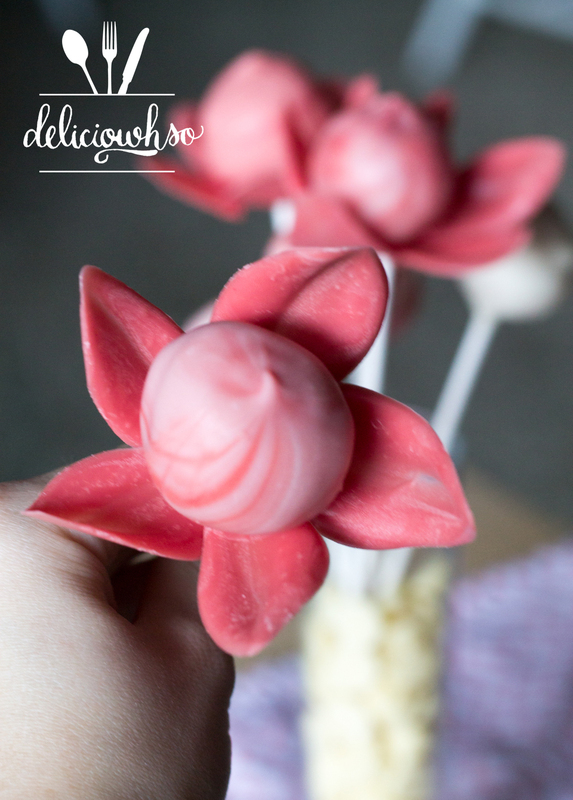 These pops are a little bit of a twist on that- incorporating flowers, chocolate, and cake! These are great to give to a friend, galentine, boyfriend, girlfriend, family member, or to treat yo-self. Not only are these cake pops a pretty treat, but they taste great! I used a delicious caramel buttercream for the cake, which tastes much better than any store-bought icing. 1. Mix the baked scrap cake with some caramel buttercream until the cake becomes pasty and doughy. 2. Roll the cake into balls, about 1 tbsp of cake for each. Place onto a lined sheet pan and freeze. 3. Melt the chocolate, and stir in coconut oil. 4. Take lollipop sticks and dip one end into the chocolate, and push it into the cold cake ball. Place the pop into the freezer to chill slightly. 5. Once the chocolate has solidified, holding the cake in place, dip your pops. You can get a cool swirl pattern by drizzling stripes of red and twisting the pop as you dip and raise it from the white. 6. Once the pop is dipped, gently shake off excess chocolate and stand to harden. Repeat for all of the pops. 8. Take the strip of parchment and place it somewhere so that it is curved and the petals can harden. 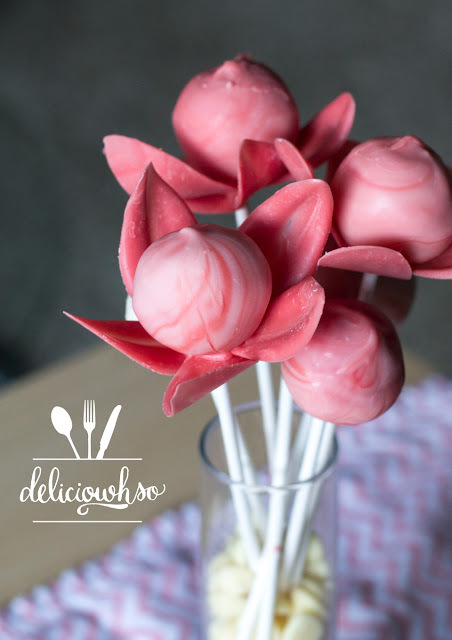 Once hardened, remove the petals from the parchment, and dip in chocolate to glue to the bottom of the pops. 9. This process must be done quickly and gently, so that the petals do not melt or break. It may take a few tries to get right, but the final product is well worth the effort!